Our lives depend on it, and we use it every day from our morning showers to brushing our teeth before bed. But just how much do you know about water? We asked prominent water expert Martin Chaplin, Emeritus Professor of Applied Science at London South Bank University (LSBU), to outline five special qualities of water for World Water Day 2016, a day designated by the UN in celebration of this life-giving substance. 1. Water is the only material on earth to be commonly found as a solid, liquid, and gas. "Our planet has vast amounts of liquid water in oceans, lakes and rivers, ice at its poles and water vapour in its atmosphere. The fact that water can be found in all three states of matter – liquid, air and gas – within the relatively small temperature and pressure ranges found on earth makes it a unique material; there is no other material on earth like it." 2. Water can be both extremely slippery, and extremely sticky at the same time. "If you place two wet planes of glass together, and move them side to side, it’s easy to see how one sheet can slide on top of the other. However, if you try to pull these sheets apart it’s somehow very difficult. Water helps the planes to slide sideways, but also prevents them from falling apart. This balance of being slippery and sticky at the same time is why you can build a castle out of sand, and yet somehow still slip over on a wet floor." 3. Hot water freezes faster than cold water. "For hot water to freeze, it must first be cooled down to become cold water, and then cooled further to become ice, right? Maybe not, as experiments have shown that hot water often freezes faster than the exact same amount of cold water, under otherwise identical conditions. Why this is the case is scientifically unclear, but the phenomenon has been known for centuries, and was first described by Aristotle. It was re-introduced to the modern scientific community by Erasto Mpemba, a Tanzanian schoolboy who refused to reject his own evidence that he could freeze ice cream faster if he warmed it first." 4. A litre of milk may well require 1000 litres of water to make. 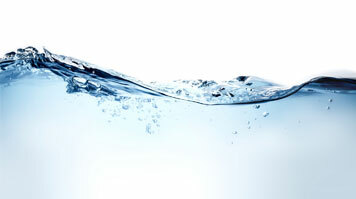 "The water that we use domestically in fact forms a very small amount of the fresh water required for modern day life. A vast amount of water goes into to agriculture; for instance, making a simple litre of milk may require 1000 times more water for the dairy farm, needed to farm the cows, irrigate the land, wash the cow-shed down and so on. As a heavily water-intensive industry, it is hardly surprising that dairy farming is common in areas with naturally high levels of rainfall, such as the south-west of England." 5. Water is actually blue – but just a little bit. "While water is almost perfectly transparent, it nonetheless absorbs a tiny amount of light, giving it a colour profile. Of this tiny amount, it is lower-frequency red light that is most easily absorbed. Because water easily absorbs this red light, it gives off the reflection of its opposite colour, which is blue. When light is observed passing through several meters of water, an intense blue colour can be seen, for example in lakes, waterfalls, or snow and ice." Find out more about studying Applied Sciences at LSBU.